Pescara listen (help·info) is the capital city of the Province of Pescara, in the Abruzzo region of Italy. As of January 1, 2007 it was the most populated city within Abruzzo at 123,059 residents, 400,000 with the surrounding metropolitan area. Located on the Adriatic coast at the mouth of the Aterno-Pescara river, the present-day municipality was formed in 1927 joining the municipalities of Pescara, the part of the city to the south of the river (then in the province of Chieti), and Castellamare Adriatico, the part of the city to the north of the river (then in the province of Teramo). 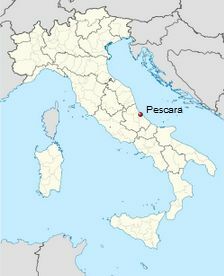 The surrounding area was formed into the province of Pescara. The poetGabriele D’Annunzio, a native of Pescara, was a major sponsor for the creation of the new city. The main commercial street of the city is Corso Umberto I, which runs from Piazza della Republica and reaches the seacoast at Piazza Primo Maggio. The rectangle that it forms with Corso Vittorio Emanuele II and Via Nicola Fabrizi encloses the main shopping district, where several of the best fashion shops are located. Corso Manthonè, the course of the old Pescara has, for many years, been the center of the nightlife of the city. City hall and the administration of the province are in Piazza Italia, near the river, and in the area between here and the faculties of Economics, Architecture, Foreign Languages and Literature of G. d’Annunzio University to the south, a business district has grown up over the years. To the immediate south of the mouth of the river is the marina. Pescara has also an important international airport, called Abruzzo Airport and one of the most important and major ports of Adriatic Sea and Italy, the Port of Pescara.